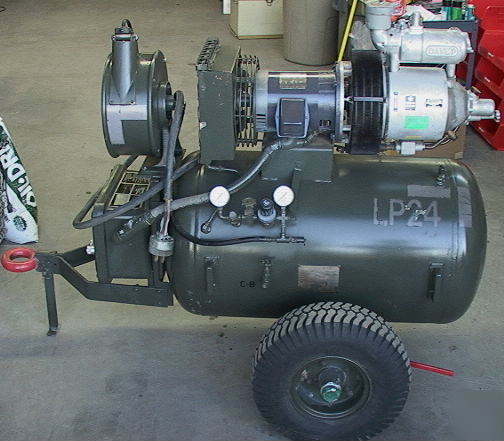 6 hp Davey rotary air compressor 200 psi trailer mount with hose reel-military surplus. Click the following link for the Davey Website. This unit has a pental hitch common to military vehicles. The image above shows the air-cooler in the middle with the retracting hose reel on the right. The image below shows the oil cooler in the middle and the compressor on the left. Not sure what the significance of the labeling on the tank shown above is. Marathon 6 horse electric motor can be either 2xx or 4xx volts 3-phase. The compressor is a DAVEY Model 13DY2MS. Note the physical data listed above. Note the hand brakes on the wheels to keep the unit from moving. small high pressure rotary air compressor application. Condition looks good used. Currently being run on 208V 3 phase and auto-cycling between 150 and 180 psi.